A boating accident is a terrifying occurrence, and it can be hard to know what to do or how to react. Understanding the steps to take following a boating accident could not only help you save someone’s life but also help you protect your legal rights. The laws in Texas, Louisiana, and Florida allow boat accident victims to pursue a claim for money damages; nevertheless, it is up to the victim to protect those legal rights. First, if the boat is still afloat and you are aboard the boat, then the first thing to do is to determine if you or anyone else needs medical attention. But, if someone has fallen overboard, then you should help in bringing the victim back onto the boat if possible. If the vessel is sinking or has broken apart, then holding onto floating debris and signaling for help is strongly advised. It is imperative that you fit boats with a life jacket on the craft. The U.S. Coast Guard has reported that 70 percent of boating accident fatalities are caused by drowning. If everyone is still on the boat, the priority shifts to managing the boat out of harm’s way to provide proper medical assistance to those onboard. After the boat is moved out of the path of oncoming vessels, the Coast Guard, Warden, or Police should be contacted immediately to alert them that an accident has occurred. Even if you do not originally consider that you were injured in the accident, it is still a good idea to see a doctor after a boating accident. In a large majority of cases, the shock of being involved in a boat wreck masks the symptoms of a serious injury. After discovering that everyone is alright and out of direct danger, you will need to obtain necessary information from individuals on the other vessel as well as identifying information of any witnesses to the accident. Names, telephone numbers, and residential addresses of the boat operators involved in the accident. Names, telephone numbers, and residential addresses of the passengers involved or aboard any of the boats in the crash. Names, telephone numbers, and residential addresses of any eyewitnesses who may or did witness the boat accident from shore or from other boats. 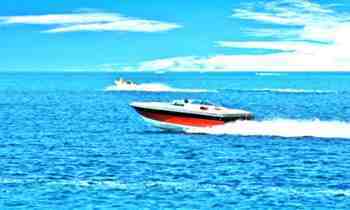 Collect the registration or identification number of the other boats involved in the accident. Collect the insurance company names and the insurance policy numbers of those who were involved in the boat accident. Moreover, you may want to take photographs of the damage to the boat and the location where the accident happened. This evidence can be helpful later to prove that the other boat operator was liable for the accident. A person has disappeared from the vessel, and circumstances indicate an injury or death occurred. Additionally, a report may need to be filed with a state agency that regulates boating. When rendering the report, it is essential that you offer specific knowledge, and never volunteer unnecessary information or speculate about the cause. Following a boating disaster, it is also necessary to report it to your insurance carrier if you owned or operated one of the boats involved in the accident. Regardless of whether you or another boater was to blame, you must report the accident to your insurer because in all likelihood you may need to turn to your insurer to make a claim for damages as a result of the accident. In cases where the other boater was negligent, reckless, or careless, you may be able to take legal action. Legal action is helpful to provide essential money for medical bills, lost wages, pain and suffering, emotional distress, and wrongful death. To discover more about your rights after a boating accident or for help pursuing your damage claim, call Testa Law Group or fill out our free case evaluation form. No matter who you are, where you’re from, or how much money you have – you shouldn’t be forced to suffer pain or loss for the faults of another’s wrongdoings. The mission of The Testa Law Group is to fight with every ounce of muscle to force wrongdoers to pay for their bad acts.